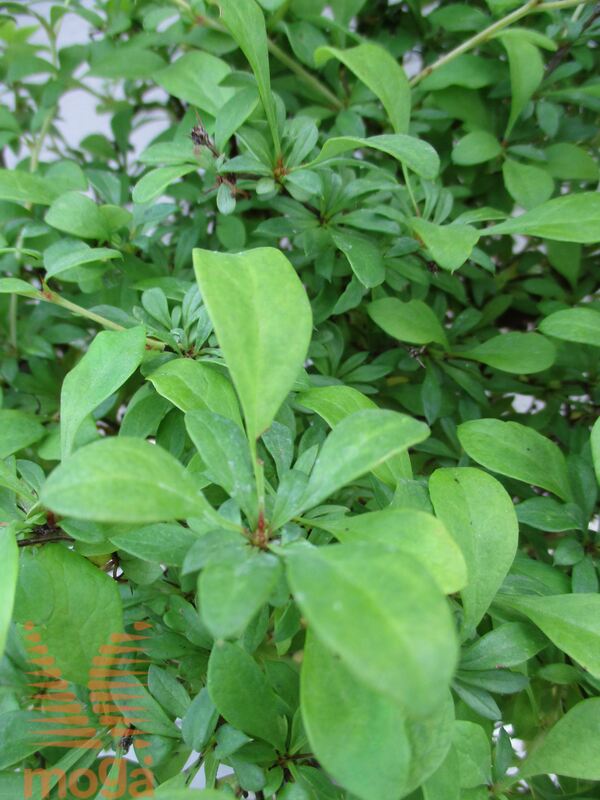 Small, bushy, evergreen shrub (H 1,2-1,5 m, W 1-1,5 m). Branches upright to open, arching, dense, thorny. Young shoots bright orange-red. Leaves broadly ovate to egg-shaped (2-3 cm), with entire margin, at first yellow, later light to mid green, underneath light blue-green; autumn colour orange. Flowers in numerous dense inflorescence, yellow to red, strongly scented. Flowering period: May. Fruits ovate (0,8 cm), fleshy, glossy, bright light red. Ripening time: October-November, fruits persist on the branches long into winter. Attracts butterflies, bees and birds. Undemanding shrub, it grows well in different soil-types, also in poor, dry, sandy soils; in distinctly sunny to slightly shady sites. Easily withstands cold, heat, drought, urban conditions and pruning.